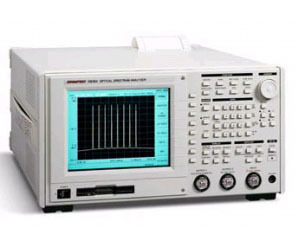 The Q8384 is a high-end optical spectrum analyzer using a new monochromator developed by ADVANTEST and featuring a high dynamic range and a high wavelength resolution. It offers the highest level of performance in the world with a 10 pm wavelength resolution and a 20 pm wavelength accuracy in the 1.55 µm band. This enables precise measurement and evaluation of wavelength characteristics.